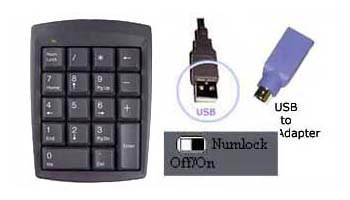 The Genovation Micropad 631 keypad is a USB and PS/2 numeric keypad. With supplied USB to PS/2 adapter, Micropad 631 can be used with any computer. Easy to use, no software to install. The Micropad 631 keypad is a USB and PS/2numeric keypad. With supplied USB to PS/2 adapter, Micropad 631 can be used withany computer. Easy to use, no software to install, just plug in and startworking. Includes two selectable Num-Lock modes for switching between number and cursor functions.